Thomas English Cochrane is a California Professional Geologist (#6124). Born and raised in Greene, New York, he wandered and roamed the area’s glacially-formed hills and valleys while growing up including the Catskills, the Adirondacks, and the Appalachian mountains. These youthful explorations led to him obtaining an under-graduate degree in Geology at the State University of New York (SUNY), Binghamton. He subsequently did graduate work in Education at Colgate University, graduate work in Geology at Indiana University, and a study in field geology at Miami of Ohio’s Geology Field Camp in Wyoming. In the early part of his career, he taught science, mathematics, earth science, and physics in his hometown at Greene Central School, later becoming the chairman of the Science Department and acting Chairman of the Mathematics Department. He then received a National Science Foundation Grant to study Glaciology for a summer on the Juneau Icefield in southeast Alaska. Mr. Cochrane began his 24-year career in the oil and gas business in 1964 in Oklahoma with Pan American Petroleum. He left Pan Am in 1968 and spent the next 20 years working as a consulting petroleum geologist. During this time, he was also editor of the Shale Shaker, a geologic publication of the Oklahoma City Geological Society. In 1988, he moved to The Sea Ranch in Northern California where he’d been spending time for over a decade, and began consulting on geologic hazards and local geology along the coast. He became a California Registered Geologist in 1995 (this designation was recently reclassified as a California Professional Geologist). 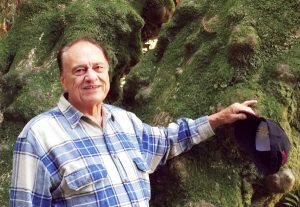 He is the author of another book, Shaping the Sonoma-Mendocino Coast—Exploring the Coastal Geology of Northern California (River Beach Press, 2017), and he regularly addresses regional groups and organizations on topics relating to coastal geology. Mr. Cochrane was also recently named Director of the Redwood Coast Land Conservancy, a 501(c)3 nonprofit which is a member of the National Land Trust Alliance and California Northern Region Land Trust Council. Well, it seems I've just naturally written all my life. Truthfully, I primarily write for me―I like the way the process of writing serves to help me crystallize my thoughts and ideas. I have a long history of writing articles. Some are funny, some are letters to the editor, and many are regarding environmental concerns. Three years ago, I decided to write books and have them published. 1. Book 1. My first published book was a geology book on the coast where I live. It’s a regional title that’s been doing very well (it was even named “#1 Bestselling Title” at a key indie bookstore here), and it’s sold nearly 2000 copies to date via placement in close to 50 bookstores and specialty retailers as well as Amazon. 2. Book 2. Was recently released and it’s an autobiography focusing primarily on my time in the oil & gas exploration business “back in the day” (“#1 New Release” in its main genre on Amazon, e.g. Historical Geology). 3. Book 3 and Book 4 are novels which are in development and will be published in the near future, my editor’s just finished the first round of editing on Book #3. 4. I also have an unpublished book of stories from my growing-up days in rural Upstate New York. I took my four children back to my hometown and read them many of these tales and also took them to places I had written about. I need to put it in book form. To begin the writing process, I write out ideas in longhand on a yellow pad. For Book 1 & Book 2, the ideas developed early into a Table of Contents which I put into my computer and printed a copy. For many days thereafter, I just thought about what should be covered in the book. Every few days or so I would print a new version of the Table of Contents. Then the serious writing began. In my files of articles I’ve written through the years I had many of the chapters already in a form I could revise into a chapter for the book. I did not tackle these chapters sequentially, but instead as my mind led me to a certain topic. This is a whole new ball game for me. While I’m an avid reader, I don’t actually read much fiction, however I do enjoy movies developed from novels. When I was young, I read a lot of Sci Fi, which is probably why I’m a scientist. I decided to write detective novels which is kind of funny because I usually get bored in reading them. Typically, they have a plot and develop a few characters—who then have a few adventures. Usually there’s a murder or something to solve of course. By halfway through the book, I have figured out how the situation will be resolved and who the murderer is. The murderer is always revealed in the last five pages—so, after thinking I’ve discovered what’s-what, I then read the last five pages and usually am right in my assessment. If not, I may skip back and read more of the middle of the book. Otherwise I rarely finish the book and cast it aside. So Novel 1 was supposed to be a spoof on novel writing. How does one begin a novel? Often it seems they start in the middle of someplace with characters the reader knows nothing about. You have to reel the reader in during the first paragraph or two or they may wander off to a different book. I began my novel with six first paragraphs with the main character ‘awakening with a start’ in six completely different places. The first five paragraphs are foreshadows of future events. The sixth one begins the story and begins the development of the main characters. Generally speaking, I write in the morning by the seat of my pants, with maybe a few notes of ideas I’ve collected during the previous day or overnight. My primary development of ideas and events occurs in the middle of the night. My two main characters wake me at 3:06 a.m. almost every night. We have a three-way conversation about a developing scene or a future scene. I tell them how I want to write it and they then tell me what’s wrong with the scene. This back/forth lasts from one to three hours, and I eventually go back to sleep. I have lots of scenes that may or may not be related to the general story. After all, in life we have all kinds of unrelated things happening to us on a regular basis. More characters appear. I have to write out a List of Characters with a brief outline of each in order to keep them straight for myself as well as my readers. Sometimes I make notes during the night, but usually I don’t. When I get up in the morning, I will hit the computer or make notes of the latest batch of ideas—that’s if I don’t have time to write that morning when the ideas are fresh. I develop a Table of Contents early in the writing which helps me keep straight in my mind where we’ve been and where we might be headed. Ideas pop in my head and I give them a Chapter Title which may change or be eliminated later. Rarely have I moved chapters around to a different part of the novel. The characters are always evolving from one chapter to the next—so to move a chapter to a different place interrupts their own evolution or discovery process it seems. You may read a chapter which has a lot of action and, instead of boom the chapter tapers off with a whimper. Maybe it ends with a shooting—a murder or whatever on a high note. The next chapter is then softer and slower—as our characters recover and assess the preceding event. Isn’t that how life is? I end my first novel (Book 3) without discovering the identity of a murderer. The murderer is finally discovered near the end of Novel 2 (Book 4). The end of Novel 1 is left open for the reader’s imagination and I also engage them in some “What If?” questions which is likely unconventional―but it seems fun to me. It probably sounds trite but my advice is just be true to yourself — plus get a good editor! Like Grandma Moses, at age 80 I thought I must do something different in the next phase of my life. Book 1 on the Sonoma-Mendocino Coast was something I could self-publish and distribute for locals to purchase. Book 2 and the novels have a wider audience so they can be marketed differently. I was referred to a publishing/marketing consultant who came highly recommended and she handled all the nuts & bolts, so that made the process easy for me. The world has changed and publishing on demand is the future. Reading books online appeals to younger people. It does not however fit into my way of reading as I like holding a book in my hands. I also like owning books as I often refer back to them.